You’d think after five or six posts on resonance, that would be enough. But NO, friends, it just keeps going. I promise that today’s post is actually useful, although to be honest it’s probably most applicable if you’re in (or going into) org 2, since the chemistry of the functional groups discussed here don’t really come up until then. Anyway. The topic of today’s post is “π donation”, which is just a way of describing what can occur in certain resonance forms where an atom with a lone pair can form a π bond with an adjacent atom of appropriate hybridization. 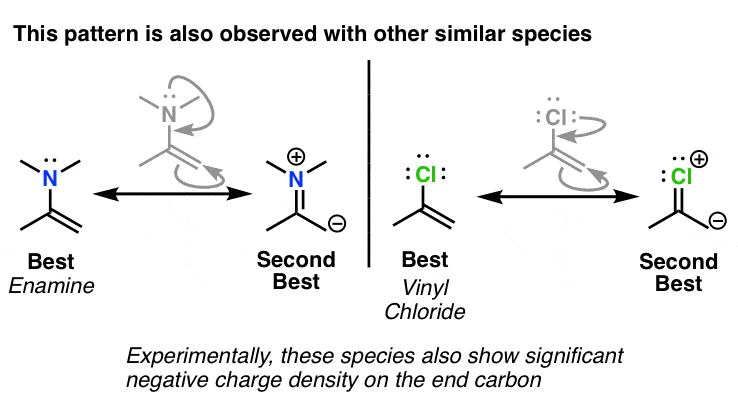 Now this has been talked about before, sure – but here, the difference is that we’ll primarily be discussing situations where the “best” resonance form is neutral, and the “second-best” resonance form is charged. Let’s look at the resonance forms of an enol (shown) and use what has already been discussed to evaluate their relative importance. Note that in order to draw resonance form D we have to do two arrow moves to avoid breaking the octet rule. 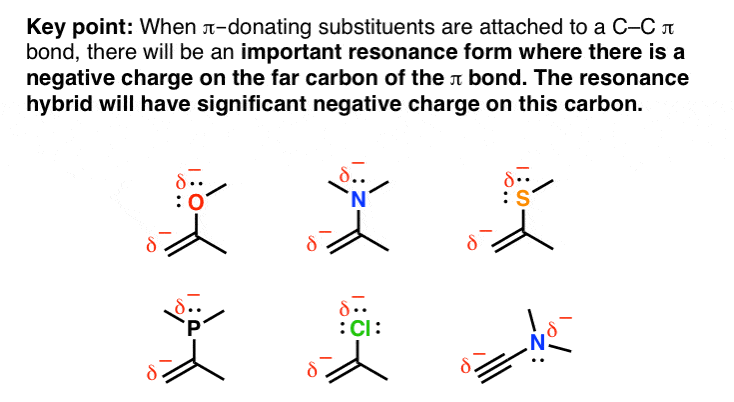 Resonance form A has the fewest charges. Resonance form D has two charges, but all atoms have full octets. Resonance forms B and C each have two charges, but have empty octets on the carbons. In evaluating these resonance forms, A will be most important due to the rule of fewest charges. D will be the second-most important since we always give atoms full octets if possible. And B and C will be the least important because each of them have atoms with less than full octets. While that’s nice, you should go on more than just some Internet dude’s appraisal of what resonance forms are most important. What about experimental evidence? Here’s three pieces of experimental evidence to support the proposal that resonance form D is more important than B and C.
reactivity profile (shown below) – enols tend to react with electropositive groups such as protons (H+ ) at the site where they bear a partial negative charge (opposite charges attract, remember). This supports a resonance form such as D being more important than, say B.
proton NMR spectroscopy is a good guide to electron density, and protons on the enolate carbon are shifted downfield relative to alkenes (this indicates the carbon is more electron rich, which supports the importance of resonance form D). electrostatic potential maps (although I can’t find a good one for the enol shown, here’s one for a related species. Note how there is less positive charge on one of the carbons). Furthermore, molecules like the ones below would be expected to show similar behavior – and they do. Take home message: alkenes attached to an atom with a lone pair such as O, N, Cl, S, etc. (often called “heteroatoms“) have an important resonance form with a negative charge adjacent to the carbon-atom bond. So what does it matter? Although it deserves a post of its own, the concept of π donation is probably the most important application of resonance you learn in Org 2. It influences everything covered in that course: reactions of aromatic rings, reactions of dienes, and especially reactions of carbonyl compounds. Here’s the key point of this post. This will have tremendous consequences for chemical reactivity, which will be the subject of a later post. For the moment I’ll just leave with a final application of π donation. And a question. 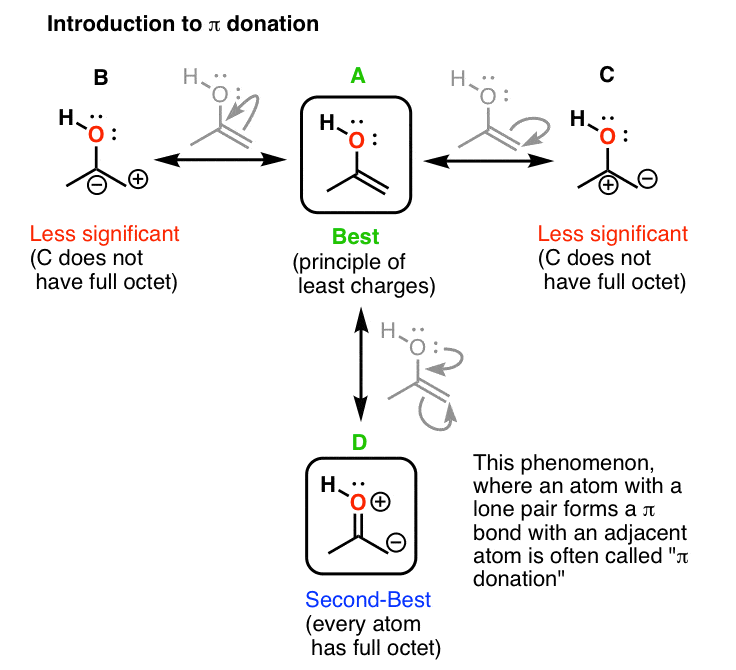 For which of these molecules do you think π donation is going to be the most important? That is, what types of atoms would be more likely to to give away their lone pairs to form π bonds? In the next (and for now hopefully last ) post on resonance concepts, I’ll talk about the opposite of π donation: π accepting. 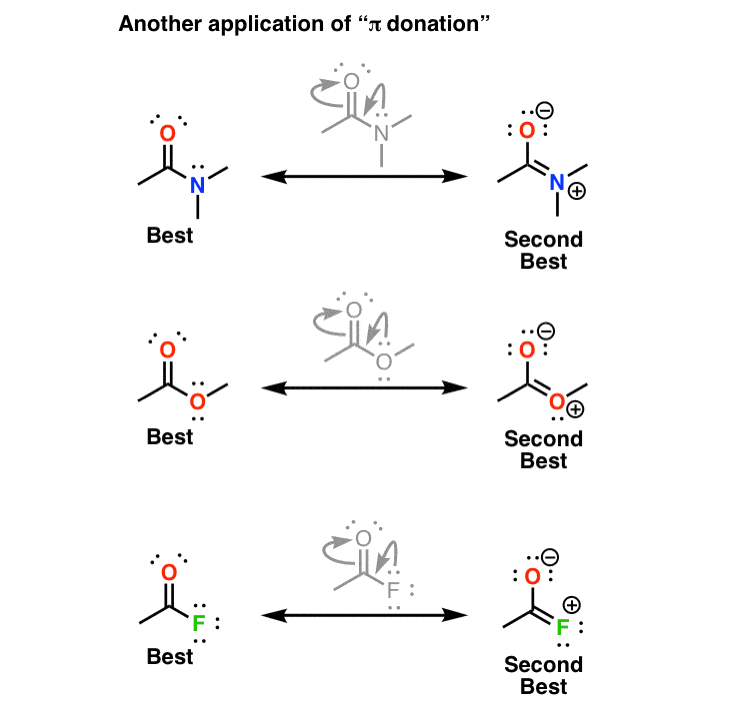 [Note 1] Across a row, π donation is inversely related to electronegativity. However caution is advised when using electronegativity to compare π donation when going down the periodic table – other effects, such as orbital overlap, also come into play. Good stuff. 4-5 articles on resonance shows how important it is! Interesting to see the concept of Lewis acids/bases being put into intramolecular perspective. Nice article(s). However, I’m a bit confused now. Previously, you told that the formal charge does not reflect the reactivity of the molecule – yet here it seems that the resonance form D reflects the reactivity. Am I missing something here? There is a small mistake in the para describing the stability of the resonance forms of enol. It reads: “C and D will be the least important..” It should be C and B. You are right. Fixed it. Thank you. “It reacts with readily with D+” in the figure on deuterating an enol. Get rid of the first “with”. hey James!!! if formal charges don`t always represent electron density then why deuterium attacked carbon?? since the formal charges don`t always represent electron density so electron density should be higher on oxygen……. That’s an excellent question. There are two ways by which atoms might have partial charge. The first, as you recall, is by examining electronegativities. The second is by analyzing resonance structures, as what we are doing here. 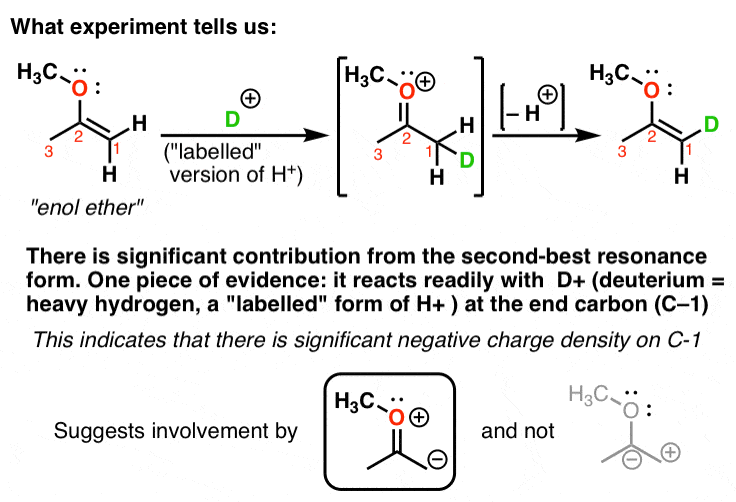 It is only by analyzing the resonance structures (and the second-best resonance form, D) that helps us understand why there is a partial negative charge on the carbon.